Tata Motors is best known for its US$2500 Nano budget car. More recently, its purchase of the iconic British marques Jaguar and Range Rover, and successful relationships with Daewoo and Fiat underlined the tectonic shifts underway in the global transport industry. Further evidence of the growing Indian powerhouse was presented yesterday when Tata pulled the wraps off a range of trucks comprising multi-axle trucks, tractor-trailers, tippers, mixers, and special application vehicles from 10-to-75 tonne GCW, and 150-to-560 bhp. The power, carrying capacity and operating economy of the range will raise the global bar for performance at a lower life-cycle cost. 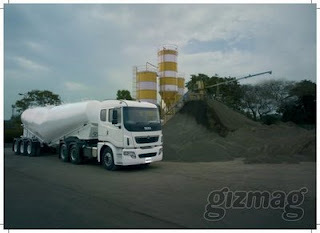 The new truck range was jointly developed by Tataand two of its subsidiaries, Tata Daewoo Commercial Vehicle Company in South Korea and the Tata Motors European Technical Centre plc in the UK. Initially destined for the Indian market, the range will also be introduced in South Korea, South Africa, the SAARC countries and the Middle East over coming years. Vehicle tracking: Every truck will have Global Positioning System (GPS) as standard fitment, enabling effective vehicle tracking. Safety & Emission: The range is designed to meet stringent safety norms of the markets that it will be sold in. In terms of emissions, the range is Euro III and Euro IV complaint, while being Euro V ready. Tata Motors is India's largest automobile company, with operations in the UK, South Korea, Thailand and Spain. Tata Motors is the country’s market leader in commercial vehicles and among the top three in passenger vehicles. It is also the world's fourth largest truck manufacturer and the second largest bus manufacturer. Tata Daewoo Commercial Vehicle Company Limited is a 100% subsidiary of Tata Motors, is the second largest manufacturer of heavy and medium commercial vehicles in S. Korea. Tata Motors European Technical Centre plc (TMETC) was incorporated in September 2005, as a wholly-owned subsidiary of Tata Motors. The company is in the business of providing design engineering, program management, testing and validation, research and development of automobiles, including launch support for manufacturing to facilitate introduction of vehicles for production. TMETC was established with the objective of providing automotive product engineering services to contemporary global standards to both Tata Motors and external 3rd party customers. In October 2008, TMETC acquired a majority holding in the Norwegian company Miljøbil Grenland. Miljø are developers and manufacturers of state-of-the-art super polymer lithium ion batteries for Electric Vehicles.